The Soda Calories- Healthy or Unhealthy ? Unhealthy sodas damage teeth, provide empty soda calories and as soft drinks go, are considered bad soft drinks for overall health. 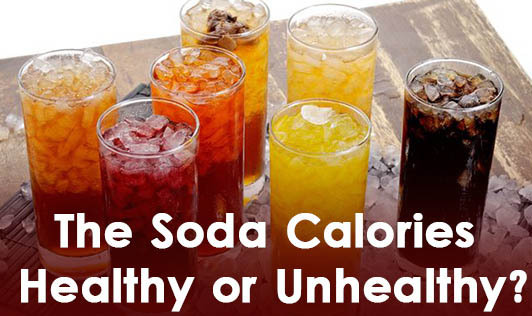 Unhealthy sodas are not recommended for either weight loss or as part of a healthy diet. Sodas or aerated soft drinks, increasingly being consumed especially by children in urban areas, with an upward trend in consumption rates in villages as well. Yes, sodas taste divine to kids, tingle their tongues and quench their thirst for the moment. But they provide poor health outcomes with each can consumed. Along with the soda, we also inadvertently consume phosphoric acid in unhealthy amounts, not to mention sugar, artificial sweeteners, caffeine, and carbon acids. The worst part of this zero nutrition beverage is that it has slowly been taking the place of milk in a lot of households - resulting in loss of much needed calcium, protein, essential fatty acids and B vitamin -Riboflavin. They also make you feel bloated and full and you end up eating less nutritious food at mealtimes. • Effects of soda on teeth: Enamel or the top most layer of teeth gets eroded due to the acids in the drink, besides the high amount of sugar in the soft drinks also leads to the development of bacteria, thus compounding dental problems. • Sodas contribute to obesity: It is not only the sugar content of the drink that adds to the calorie content as mentioned earlier leading to obesity - but even diet colas may cause problems. The aspartame or artificial sweetener makes people crave for food as it induces hunger that can lead to obesity. • Soft drinks make you lethargic: diet colas may cause dizziness, cramps and sometimes migraine and over long term use are known to reduce memory too. • Soft drinks cause deficiencies/ lead to malnutrition: - people addicted to sodas do not consume much food or use excessive amounts of diet colas to kill hunger and land up with various deficiencies or even malnutrition. • Stomach: Soft drinks contain phosphoric acid which affects the acid balance in the stomach and interferes with its normal functioning. This causes indigestion and a feeling of bloating and discomfort. • Damage to heart: Invariably the sugar added in soda is fructose-high corn syrup which may be damaging to the heart. Minerals such as calcium and magnesium are required for normal functioning of the heart and their absorption might get hampered. • Damage to Kidneys: The kidneys are unable to excrete phosphoric acid causing them extra stress. Sodas also make the kidneys leach out calcium from the body causing it to collect in the kidneys and may cause painful kidney stones. • Damage to skin: By drinking soft drinks we are depriving the body of essential vitamins and minerals leading to premature wrinkling and ageing of skin. Fresh fruit juices, milk and even plain water are preferable any day. • Damage to bones: Phosphoric acid may deoxidize blood and may eventually soften the bones by extracting calcium from ithem leading to osteoporosis down the line. • Action of consuming and withdrawal of Caffeine: Caffeine added to sodas is addictive and is readily absorbed by the body. Sodas may lead to disturbed sleep, cause hyperacidity or even dehydration.